The following 71 events in 9 countries formerly part of the Soviet Union were listed in Google during the week of September 21-28 under the key words “Международный день мира” and “Міжнародний день миру”as well as “International day of peace”. Participants of the action in Sverdlovsk launched balloons into the sky with white doves, on which were written the names of the deceased warriors of the Great Patriotic War. We begin with articles from RUSSIA (in alphabetical order), followed by ARMENIA, AZERBAIJAN, BELORUS, GEORGIA, KAZAKHSTAN , KYRGYZSTAN, MOLDOVA and UKRAINE. BASHKORTOSTAN, RUSSIA: Students of our college, Baskirsky College, together with the Youth Public Chamber at the State Assembly-Kurultai of the Republic of Bashkortostan, laid wreaths to the monument of the grieving mother in Victory Park, paying tribute to all those who lost their lives in local wars. This event is designed to unite the youth of Bashkortostan in patriotism, respect for the fallen and for a peaceful sky over our head. BIRYULYA, ALTAI REPUBLIC, RUSSIA: The action “We are for Peace!” Was prepared by the pupils of the pre-school groups of the school No. 933 on Thursday, September 20. In anticipation of this event, the children talked with the psychologist Svetlana Bolotskikh about peace, and then the older children created a bright “Bird of Peace” with the help of appliqué. “Peace time is a blessing that enables us to live steadily: to study, work, create families, raise children,” said Svetlana Bolotskikh. -Svetlana also noted that on the day of the holiday no one was indifferent: even the smallest pupils of the pre-school department all together made a large drawing of the Earth, and then they stamped it with their handprints. BOLSHAYA BALASHIXA, MOSCOW OBLAST, RUSSIA: On the eve of the International Day of Peace the Library Center “Yuzhny” offered its readers poetic information, which included collections of poems about good and peace, about friendship and love for the Motherland. Adults and children took part in the poetic marathon and in the choice of the poems, most vividly defining the theme of peace and mutual understanding. Samuel Marshak’s poem, which urges children to play not in war, but in peace, gained the greatest number of votes. The information hour in the library was joined by 18 people. BOLSHAYA EKATERINOVKA, AKARSKY REGION, RUSSIA: In Bolshaya Ekaterinovka schoolchildren released into the sky the doves of peace. A single class hour was devoted to the International Day of Peace in a rural school on September 21. Students and teachers of the MOU-SOSH village of Bolshaya Ekaterinovka joined the action “Dove of Peace”. At the beginning of the event, there was a single class hour in the 1-11 grades of the school, which was led by the eighth-grader Veronika FEDINA, sixth grader Darya KAZARYAN and sixth grader Victoria PISARENKO. They told about the purpose of this action, read poetry about peace and white doves – the symbol of peace. In memory of those who died during wars, candles were lit and a minute of silence was declared. The pupils of primary classes made drawings “We are for peace on the whole planet.” The action ended with the release into the sky of colorful balloons with paper doves attached. BUGULMA, TATARSTAN, RUSSIA: The mobile cultural center of the Centralized District Club System of Bugulma held a thematic event “The World Begins from Childhood” for the first-graders of School No. 3. Employees of the cultural center told the children about memorable dates, the history of their origin and their significance. Girls and boys played games for the knowledge of kind words and countries of the world. They painted our planet to give their drawings to family and close people. And at the end of the event all participants received flyers in honor of the significant dates and wished each other a peaceful sky over their heads, joy and happiness. CHELYBINSK RUSSIA: In our lyceum (Licium 102 Chelybinsk) , we celebrated the International Day of Peace for the second year . Today we talked and sang about peace ! Hand over hand , under the sounds of bells of peace, reminding us that we have not been touched by war … And at the end of the holiday lyceum students of 8-11 classes have built a simple , but important word “PEACE” . Lyceum 5-7 classes lined up in the form of the Russian flag. The director of the lyceum Marina Leonidovna Oksenchuk, the deputy director for the Verkhovna Rada Larisa Stepanovna Lebedeva, Alexander Valerievich Kurochkin and the hosts of the holiday launched the white doves into the peaceful sky . HASAVYURTOVSKY DISTRICT, DAGESTAN, RUSSIA: The libraries and preschool institutions of the Hasavyurtovsky district celebrated the International Day of Peace. In the libraries of settlements the lessons of peace were held, within the framework of the “We are for Peace” regional action, where the library leaders told the readers about the Day of Peace. The children rang the little bell so that its ringing made everyone think about how fragile our world is, which means that it must be protected. Multicolored balloons were released into the sky. In the rural libraries of Hamavurt, Kandauraul, Pokrovskoye, Temiraul, Pyatiletka, Boragan-gechu, Botashurt, there have been organized talks on peace. IVANOVO, RUSSIA: Using Skype the students and teachers sang songs with teachers and students from other countries. KAZAN, TATARSTAN, RUSSIA: More than 2,000 students of the Kazan Federal University took part in a large-scale flash mob. In the sky were launched white doves – the symbols of peace, as well as white and blue balloons. KAZAN, TATARSTAN, RUSSIA: In the house of culture “Peace” will be a holiday in honor of the International Day of Peace – “Let’s live in peace!”. The day-to-day activities of the United Nations to maintain peace and tranquility, to comprehend the existing world problems – that’s what the organizers of the event want to draw to the attention of children and parents. For the youngest members of the Peace Club there will also be organized a program where the children will draw the emblem of the “dove of peace” and understand the meaning of peace for each person. • a collection of puzzle size 3×2 m, etc. During the whole event, the “Postcard to a friend” platform will function, which will allow participants to send a postcard to anywhere in the world. It is also planned to hold a “Ethnoobjective” photocross for photographers. The event will end with a massive launch of balloons into the sky under the motto “We are peace!” The organizers of the Concert are the Regional Public Organization “The Academy of Creative Youth of the Republic of Tatarstan” with the support of the Ministry of Youth Affairs of the Republic of Tatarstan. KOSTROMA, RUSSIA: Kostroma schoolchildren also joined the social movement for the International Day of Peace. Teachers of Gymnasium No. 28 held an open lesson for children on October Square. Why is peace and harmony so important to all who live on Earth? The answer to this question was learned today by students of lower grades. They independently made paper doves and gave them to people passing by. KAMENSK-URALSKY, RUSSIA: September 21 in the central square of Kamensk-Uralsky will be the All-Russian patriotic action “Dove of Peace” for the second time in the history of our city. The action is dedicated to the International Day of Peace. Its main goal is to honor the memory of the veterans who defeated fascism in the Second World War. Participants in the action – schoolchildren and students, will launch white doves and balloons into the sky, thereby expressing gratitude to the front-line soldiers and workers of the rear and pay tribute to their immortal feat in the name of peace on earth. .The organizers of the event – the Center for Youth Policy of Kamensk-Uralsky invite residents of the city to become active participants of this event. KARGAPOLSKY DISTRICT, KURGAN OBLAST, RUSSIA: On September 21, the International Day of Peace was held in all educational institutions and institutions of culture and art in the Kargapolsky district, together with volunteer units, secondary professional education institutions under the motto “The right to peace: the seventieth anniversary of the Universal Declaration of Human Rights”. About 3000 children, teenagers, teachers and parents took part in the events. The children lit candles in memory of those who died defending the world, thinking about “What is Peace?”, “Why do we celebrate the Day of Peace?”. A minute of silence passed, at the end of which white doves, a symbol of peace, were released. More than 80 events were held: Peace Bell, We for Peace, Dove of Peace, We Are for Peace on the World, information watch cycles “Together for Peace: Respect, Security and Dignity for All”, ” Day of Peace “,” The world needs everyone “, drawings competitions on asphalt” Let there always be a sun “,” My happy planet “,” Peace to my house “, game programs” Journey on human rights “,” All right to know about the right ” “Children for Peace on Earth”, sports competitions. KURGAN, RUSSIA: In “Secondary school №52” students together with the volunteer detachment “Generation NEXT” (the head of the detachment – the teacher of history, social science Lusnikova Nelli Anatolievna) joined the Action “Dove of Peace.” Before the school, a flashmob “Peace Dove” was held in support of peace – a massive one-time launch of helium balloons with white paper doves attached along with Dunaevsky’s song “Fly, doves, fly.” On the same day, within the framework of the action, students of 9th grade of our school, participants of the volunteer squad “Generation NEXT” Egor I. and Maxim R. took part in the international video conference “Partnership of sister schools” in the framework of the international children’s and youth movement. Among the participants of the video conference were representatives of the Russian Embassies in Algeria, Azerbaijan, Serbia, the Lugansk People’s Republic, etc. The participants of the conference discussed issues of preservation and transfer of historical and cultural heritage, respect and development of friendly relations between peoples. KETOVO, KURGAN OBLAST,RUSSIA: On September 21, the International Day of Peace was held in the Ketovo Children and Youth Center. In the framework of patriotic education, the action “Dove of Peace” was held, conversations “What is Peace” were held, the students of the center made doves from paper, drew drawings on the theme “World Peace”, and the dance group “Mirage” organized a flash-mob. MIASS, CHELYABINSK REGION, RUSSIA: Elementary school students cut out white paper doves as the symbol of Peace. Students in grades 1-3 decorated their classrooms with them, and the fourth graders also painted by themselves. Let the sky be peaceful forever, let there be no war ever! 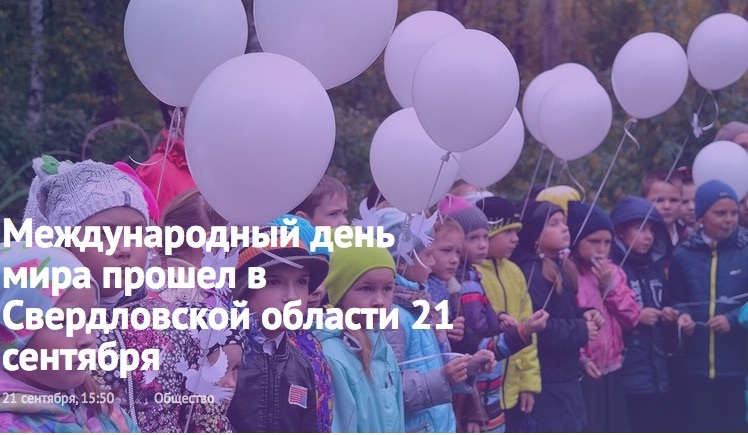 MOLZHANINOVSKY, RUSSIA: In Molzhaninovsky, they will hold a thematic event “Peace in the World” timed to coincide with the International Day of Peace. As reported in the administration of the municipal district Molzhaninovsky, the holiday will be arranged on Saturday, September 22. The event will be held in the district administration located on the street 4th Novoselki, 2. The beginning at 11.30. Admission is free for all comers. MOSCOW, RUSSIA: Near the walls of the Victory Museum on Poklonnaya Hill on September 21, 2018 as part of the “Dove of Peace” campaign there will be a flashmob dedicated to the international day of peace About 500 students from various schools in the capital will release balloons with attached paper doves to the sky. It is specified that for participants in the flashmob there will be adistribution of St. George ribbons, which you can take as a memory or tie to your dove. After the flashmob during the whole working day of the museum it will be possible to support the action by attaching a paper dove to the special construction “Dove of Peace” at the entrance to the building. NEKRASOVKA, RUSSIA: Nekrasovka will celebrate the International Day of Peace with a concert, “The Stars Are Lighting At Us,” in the recreation center “Zarechie”. For the guests of our House of Culture the leading amateur art groups will perform, which after the summer break has already started creativity, – explained the art director of the institution Elena Andrukhan. The concert will begin at 18.00. The ticket price is 200 rubles. NOVOKOSINO DISTRICT, MOSCOW, RUSSIA: Within the framework of the holiday, a thematic action “We are for Peace!” was organized at school № 2128 on September 21. According to the deputy director of the school Oksana Varchenko, the event has a strong message – to bring to people the danger and the ruinous nature of wars. Under the guidance of teachers there were organized class watches, promotions and exhibitions. NOVOURALSK, RUSSIA: In our school, Novouralsk School No. 2, there was a single class hour “Spirituality Hour: Dove of Peace . ” Class leaders on a class watch spoke with children about the importance of preserving peace on planet Earth . Pupils of each class made doves and designed a large school panel “September 21 – International Day of Peace!”. On the same day, pupils of the 5th class held a rally and launched white balloons with paper doves and wishes of peace throughout the world. Help in organizing and holding the action “Dove of Peace” was provided by an individual businessman Nikolai Korchagin . PETROZAVODSK, RUSSIA: In educational organizations, class hours will be held: “The world needs everyone”, “How to celebrate the Day of Peace in different countries”, “The history of the birth of the symbol” Dove of Peace “,” If you are kind … “, drawings and posters. Students of the school № 25 on the cinema club will remember about Samantha Smith, they will talk about the history of her life. And the smallest schoolchildren will make white cranes, the press service of the mayor’s office of the Karelian capital reports. On September 21 at 12:30 on the territory of the square near the Alexander Nevsky Cathedral an ecological action “For the sake of peace” will be held to plant trees with the participation of representatives of national public associations. In the ethnocultural center of the Karelian people, “The House of Men” on the street. Working, 9-a, will be a meeting of the Council of National Public Associations. REVDA, SVERDLOVSK OBLAST, RUSSIA: On September 20 and 21, single hours of spirituality dedicated to the International Day of Peace were held at the IAOU Euroimgnasia. Lecture groups (junior and senior staff) of the Unarmy Detachment “Patriot” told the gymnasium students about the history of the holiday and about such a symbol of peace as the World Bell, cast from coins, which was gathered by children from 60 countries. We recalled the most famous symbol, the author of which was the Spanish painter Pablo Picasso – a white dove, holding an olive branch in his beak. The meaning of the word “tolerance” was discussed. At the end of the hour of spirituality, the lecturers gave the Euro-Ginamists paper white doves, so that, by writing the wishes of the world to the inhabitants of the planet Earth, they presented these little symbols to their relatives, relatives and passers-by on the streets of the city. Fifth-graders participated in the city action “Dove of Peace”, at which patriotic associations and volunteer detachments of educational organizations of the city, representatives of city veterans’ organizations gathered near the monument to Soldiers of the Internationalists. After the words of honorary guests of the event, the boys simultaneously released into the sky white balloons with white paper doves attached to them. White balloons carried away the names of deceased participants of the Great Patriotic War and the workers of the rear who devoted their lives to defending their native Motherland and establishing peace on the planet Earth. ROSHAL, MOSCOW REGION, RUSSIA: On September 21, 2013, an event dedicated to the International Day of Peace was held in the KDOU “Kindergarten No. 1”. Today the students of the senior speech therapy group together with the Authorized Kupriyanova TV and the tutor Burukhina LB organized an integrated educational activity dedicated to this important day. We devoted the hour of the world to realize once again that the future lies in the hands of children, and from the very childhood we must learn to live together, understand each other and protect a fragile peace. The children painted the application of a dove (the symbol of peace) on the subject of the lesson. SARATOV DISTRICT, RUSSIA On the International Day of Peace, the Saratov Historical and Patriotic Complex “Museum of Combat and Labor Glory” presented an exhibition of a painting by artist Alexei Krasnov – “Shaolin Square”. In the picture, the artist painted the square of the Shaolin monastery in anticipation of receiving guests. In 2018, Alexei Gennadievich Krasnov was on a creative expedition in China, where he made many paintings about life in the Shaolin Monastery. He became the first Russian artist invited by the rector of the monastery Shi Yong-xing to popularize the values ​​of the Shaolin monastery around the world in the language of painting. SMOLENSK, RUSSIA: Photos of students at the MBOU School #33 releasing balloons of peace. SIMFEROPOL, CRIMEA, RUSSIA: Within the framework of the celebration of the Day of Peace, a mini-exhibition of the puppets of the peoples of Russia in national traditional costumes made by the students of the Department of Decorative Arts, the Faculty of the History of Arts, the Crimean Tatar language and the literature of the Crimean Engineering and Pedagogical University is presented in the SB RK “Crimean Tatar Museum of Cultural and Historical Heritage”. ST. PETERSBURG, RUSSIA: September 21, within the framework of the Second Eurasian Forum in the Peter and Paul Fortress, an action was held timed to the International Day of Peace. Representatives of St. Petersburg public organizations and guests of the Forum took part in the event. The participants of the action paid a minute of silence to the memory of victims of violence, wars and terrorism. Then, addressing the assembled women, the Chairman of the Federation Council of the Federal Assembly of the Russian Federation, Valentina Matvienko, made a speech. She noted that it is women leaders who are always at the forefront and are distinguished by a special strength of spirit, intellectual spiritual potential. They make a great contribution to the development of the person’s personality and the renewal of the world.A concert was held at the Cathedral Square, which clearly showed how people of different nationalities are getting along in Russia. Guests of the holiday could hear Udmurt songs, see traditional dances of Ossetians, Koryaks, Georgians and other peoples. The action ended with a symbolic action – the participants of the event released doves into the sky over Petersburg. TAGANROG, ROSTOV OBLAST, RUSSIA: Young volunteers of our school (Tag 21) conducted “линейки” for students of the primary school. Traditionally, the celebration of this Day begins at the Peace Bell. The students of our school joined the World Action. Our bell is small, but its ringing will make everyone think: how fragile our world is, and therefore it must be protected! This is our voice of memory, peace and joy. SVERDLOVSK REGION, RUSSIA: Residents of the Sverdlovsk region took part in the action “Dove of Peace” in the framework of the International Day of Peace. September 21, Participants of the action launched balloons into the sky with white doves, on which were written the names of the deceased warriors of the Great Patriotic War. The deputy director of the regional center of patriotic education, Galina Yakovleva, said that this event is aimed at expressing solidarity to all people and showing that we are for peace. In Yekaterinburg pupils of schools and students of universities and colleges joined the action. Participating towns included Serov, Krasnouralsk, Kamensk-Uralsky, Revda and other cities and towns in the region, according to the “Official website of the government of the Sverdlovsk region” . VOLGOGRAD, RUSSIA: On September 21, the International Day of Peace, Volgograd residents will be able to help homeless people by giving unneeded clothing, in the framework of the third citywide action “Shade in the Window”. As the representatives of the charity organization Caritas-Volgograd said, they chose this name because the lampshade in the window for all of us is a symbol of a cozy family evening and a peaceful life. Volunteers plan to attract the attention of citizens to people who have no shelter. Within the framework of the event, all comers will be able to show creative activity and solidarity with people left without a home: draw “their window” or make a selfie or photo in the window frame, and find a good neighbor-interlocutor. The action “Shade in the Window” will begin at 4 pm on the square in front of the entrance to the Catholic Church of St. Nicholas, which is located in the Central District of Volgograd. VOLGOGRAD, RUSSIA: MOU kindergarten No. 96 of Krasnooktyabrsky district of Volgograd is preparing to celebrate the International Day of Peace. It is very useful and important to talk with children about the most important thing – about the world on the planet. Children will know where this holiday came from, get acquainted with its symbols. The future is in the hands of children. It is necessary to teach children to live together, understand each other and protect a fragile peace. OLOKONOVKA, BELGOROD REGION, RUSSIA: at 7 Pionerskaya Street, Skype sessions were held with students and educators around the world with peace messages and discussion about what peace means for you personally. Other activities included singing a song about peace in Russian and in English, making origami doves as a symbol of peace, making a paper peace chain, Peace wordsearch and a Peace cycle race. VORONEZH, RUSSIA: A single hour of spirituality “Dove of Peace”, timed to the International Day of Peace, was organized in the educational institutions of Voronezh.. Dozens of general education schools, kindergartens, as well as institutions of additional education joined the mass patriotic flash mob. In the kindergarten of General Education No. 157, the event was prepared in advance: the pupils themselves cut dove figurines out of paper, and at home together with their parents wrote the names of their grandmothers and grandfathers who participated and died in the Great Patriotic War, and also worked these years in the rear. YAMAL-NENETS AUTONOMOUS DISTRICT, RUSSIA On the International Day of Peace the first-year students of the Kurgan State University and the staff of the representative office of the Yamal-Nenets Autonomous District will tell about the international ecological expedition to the island of Velkitsky. Also, the students will be presented with the international forum-festival of youth “We are for Peace in the World”, which is held annually in Bulgaria. YEREVAN, ARMENIA: The International Day of Peace celebrations in school № 194 on September 21 included singing, dancing, and artwork for the students, followed by a presentation to teachers about peacemaking activities. We organized two competitions for students on the theme “I am drawing peace.” About 10 participants from ages 8 to 12 painted on paper, and about 150 participants from ages 6 to 12 drew with colored chalks on the pavement in front of the school. BAKU, AZERBAIJAN: The International Museum of Peace marked the International Day of Peace in Baku, September 21. In connection with this, on the joint initiative of the Azerbaijan carpet museum and the Sabail district of YAP (The New Azerbaijan Party, Yeni Azərbaycan Partiyası) on September 14 in the conference hall of the museum a conference was held, the purpose of which was to educate the younger generation about the significance of the International Day of Peace, celebrated on September 21. The participants of the event got acquainted with the exhibition of children’s works on the theme “Peace – Peace!”, Organized by the Children’s Museum Department in the foyer of the Azerbaijan Carpet Museum. The children’s choir “Banovsha” named after Afsar Javanshirova of the Azerbaijan State Television and Radio made a concert at the event. The event ended in front of the Azerbaijani carpet museum, where children launched white pigeons and colorful balloons symbolizing the world. BARANOVICHI DISTRICT, BELORUS:Today, the International Day of Peace, the action “Child of Peace” was held at the “Stolovichi Secondary School” of the Baranovichi District wirh he chairman of the regional organization of the Belarusian Peace Foundation. BOBRUISK, BELORUS: A music and entertainment program “DETSKOKE” dedicated to the Day of Peace was held on September 22, 2018 for children of the State Institution “The Palace of Arts of Bobruisk”. Clowns had fun with the children at the disco, held dance contests, interesting and fascinating games, sports relay races, in which the children were pleased to participate. BREST, BELORUS: This year, the traditional event in support of the International Day of Peace – “Day of Peace in Brest 2018” will take place with the organization and effective support of the Brest Regional Center for the Olympic Rowing Reserve. The participant needs to purchase a lamp in advance in order to float it on the “alley of peace”. The lighting time is at 20:00. Within the framework of the event, there will be a concert with participation of both young performers and already known in our city vocalists and dance groups, For the first time in the history of this event, an hour-long youth disco is planned to be run by our young radio host, performer Dmitry Nogovitsyn, starting at 20:15. GANTSEVICHI, BELORUS: On this day, the workers of the cinema “Maladossi” held an action, where the children wrote wishes on paper doves. These birds, which are symbols of peace, were attached by schoolchildren to balloons and released into the sky. GORODOK, VITEBSK, BELORUS:The School of Peace, the first in the Vitebsk region, opened today in Gorodok on the initiative of the regional branch of the Belarusian Peace Foundation, with the support of local authorities, and is located on the basis of secondary school №1. This initiative is implemented in the republic through the regional and regional branches of the Belarusian Peace Foundation. Schools of peace have already been set up in the Gomel region, in Minsk, and it would be wrong if it were not organized in the Vitebsk region, which suffered badly during the Great Patriotic War. Gradually, they will appear in other parts of the region. So, Miory, Glubokoe, Sharkovshina have already shown interest. The opening of the school took place in the framework of the international gathering of young envoys of the world, which was organized in Vitebsk for the first time and united the children of Gorodokhshchina, Shumilinshchina and the town of Dedenevo in the Moscow region. The site was the health camp “Orion” in the village of Kabishche. From September 20 to 22 schoolchildren from Belarus and Russia exchanged opinions and lived a rich social life. It is symbolic that the events took place on September 21 – the International Day of Peace. VOLKOVYSK, GRODNO REGION, BELARUS: Of course, our gymnasium can not but take part in the actions that are taking place this day around the world. Our “Cranes of the World” are the traditional ones, which children make themselves and give out to passers-by near the shops, in order to remind people again that peace is important for children on the planet. ABKHASIA, GEORGIA Organized by the Government of the Autonomous Republic of Abkhazia and suported by the Charity Humanitarian Center “Abkhazeti” the conference “The word existed first- Journalism of War and Peace” was held at Betsy’s Hotel. An exhibition of IDPs (internally displaced persons) from Abkhazia dedicated to the International Day of Peace were held at the Betsy’s Hotel, as well. At the end of the conference participants received the appeal of Abkhazian colleagues. KAZAKHSTAN: The celebration of the International Day of Peace in the State Bank of the Republic of Kazakhstan “Crimean Tatar Museum of Cultural and Historical Heritage” is held to draw visitors’ attention to the day-to-day activities of the UN to maintain peace and tranquility on our planet, to commemorate and strengthen the ideals of peace both within and between nations and peoples. At the stand for visitors will be posted information about this holiday, which is very important for people around the world. At the mini-exhibition puppets will be presented in national traditional costumes of some peoples of the world, reflecting their culture, traditions and history. BISHKEK, KYRGYZSTAN: Writing from School-gymnasium No. 63, on September 21, in Bishkek, Victory Square hosted an event timed to the International Day of Peace. During the holiday, the action “Dove of Peace” was held, in which labor veterans, participants of armed conflicts, students and schoolchildren, including our students, took part. The participants stood with balloons, which, as planned, were launched into the sky. Of course, for some of us, peace is an everyday reality. Our streets are calm, our children go to school. Where the foundations of society are strong, the priceless gift of peace can not be particularly noticed by anyone. TRANSNISTRIA, MOLDOVA: The first large-scale action to the Day of Peace in Transnistria was held by the youth organization Zvezda. The column passed from the boulevard. Yuri Gagarin to the square. A. Suvorov. On the occasion of the holiday, a drawing contest took place in the capital’s square. At the end of the action, dozens of white doves – a symbol of peace – were released into the sky. ELIZAVETOVKA, UKRAINE: To draw the attention of the pupils of our school and their parents to the theme of peace on the whole Earth, volunteers from the organization “Memory” will introduce students to this date. Throughout the day at the school, students and parents will receive the emblems of white doves. KAMENSKOYE, UKRAINE: Kamenskaya secondary school No. 31 is annually attached to the celebration of this holiday. On Friday, September 21, the leaders of the student’s self-government organized and held for the schoolchildren the “Song Opening Day of Peace” and a dance flash mob “Children of the World – for Peace!”. KHARKIV, UKRAINE: The International Day of Peace was celebrated In the park Kvitki-Osnovyanenko. KIEV, UKRAINE: On the morning of September 21, the action “Peace and Unity for Ukraine!” Was held on the square at the National Museum of History of Ukraine in World War II. One of the integral actions of the Day of Peace, beginning in 1986, is the symbolic Peace Procession initiated by Indian peacemaker Sri Chinmoy. The event was attended by more than 2,000 people who honored the memory of those who died in Afghanistan with the laying on of flowers.The procession column was opened by a brass band with a banner, followed by cadets, military and children’s dance groups in embroideries. Mass performance with dancing accompanied by live music became the main part of the program. The square itself was decorated with blue and yellow balloons and flags of Ukraine, and the final of the celebration was the launch of hundreds of balloons into the sky, as a symbol of faith in a peaceful future. KURAKHIV, UKRAINE: September 22, when the whole world celebrates the International Day of Peace, the Kurakhiv city center of culture and leisure held a city action, a thematic program “I want to live without war!”. All educational and preschool institutions, creative collectives and simply residents of Kurakhovo took part in it. ODESSA, UKRAINE On the Day of Peace on the Potemkin Stairs in Odessa, a bright flash mob was held with the participation of schoolchildren, cadets, members of the public and clergy. The organizers are the Odessa Regional Council of Peace. The event was timed to coincide with the 16th anniversary of the proclamation of the International Day of Peace. More than 500 flashmob participants marched from Dumskaya Square along Primorsky Boulevard to the monument to Duke de Richelieu. On the Potemkin Stairs, students, cadets, members of the public lined up, forming the word “Peace”, and performed the Prayer for Peace. A concert took place in the square, during which the artistic collectives of the city presented the dances of different nations of the world. DONETSK, UKRAINE: The ethno-restaurant “Yo-Moe” invites all residents and guests of the city of Donetsk to celebrate the good and truly bright holiday of the “International Day of Peace” wth peace contests, “light” gifts and a mood of peace and good fun. September 21 starting at 18:00. DONETSK, UKRAINE: Russian performers Alexander Buynov, Tatiana Lipnitskaya (Bianca), Olga Kormukhina and the band City 312 will perform in Donetsk on September 20 for the International Day of Peace . The concert will take place on the main square of the capital – Lenin Square. The concert is organized with the assistance of the Russian Center. KRAMATORSK, UKRAINE: September 21 in honor of the International Day of Peace at the central park A. Pushkin, a mass flash mob was organized by students of Kramatorsk. The guys in white T-shirts with the logo of the 150th anniversary of Kramatorsk danced very brightly and vigorously, and in the end they congratulated the city on Happy Birthday! As it was, you can look in our small video, and if you want to see the flashmob live and completely, then you come to the central square of the city on September 22, at 17-00!